Our craft group started as an excuse to drink wine and hang out, but we have had had many significant achievements; Lucy knitted her first scarf, Anja made beautiful monochrome slippers, Kris taught us all how to crochet and we contributed to ending world hunger. As caring, social justice seeking, change-the world-types the #impiece campaign was right up our alley. We all really got into making the jigsaw pieces, chatting about the slogans we chose and talking about what a world free of hunger and injustice would look like. It was a perfect project for craft night as the Jigsaw pieces were so quick and easy to finish. None of us had ever met our MP, if I’m honest I didn’t even know who it was! But we decided we really wanted to share our passion for the #imapiece campaign with the person responsible for representing us in Parliament. So having worked out who that person was (! 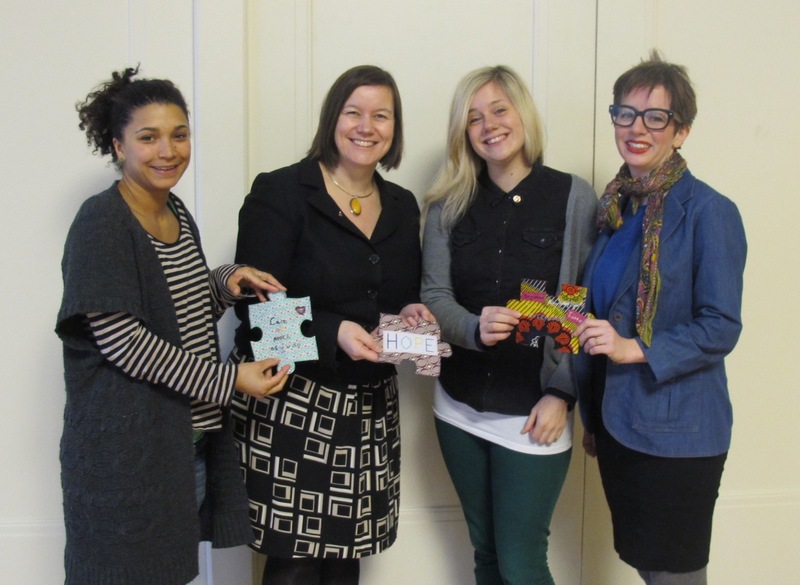 ), we sent an email to Meg Hiller requesting a meeting to give her the jigsaw pieces we had made for her. We heard straight back from Meg and booked in a time to meet up with her. One morning before work, Sarah Lucy and I went along to the Hackney Town Hall Jigsaw pieces in hand ready to met with our MP and urge her to support the campaign. I’ll admit I was a bit nervous, I was worried I wouldn’t know what to say or that Meg might ask us a question I didn’t have the answer too or point out how amateur our stitching was! 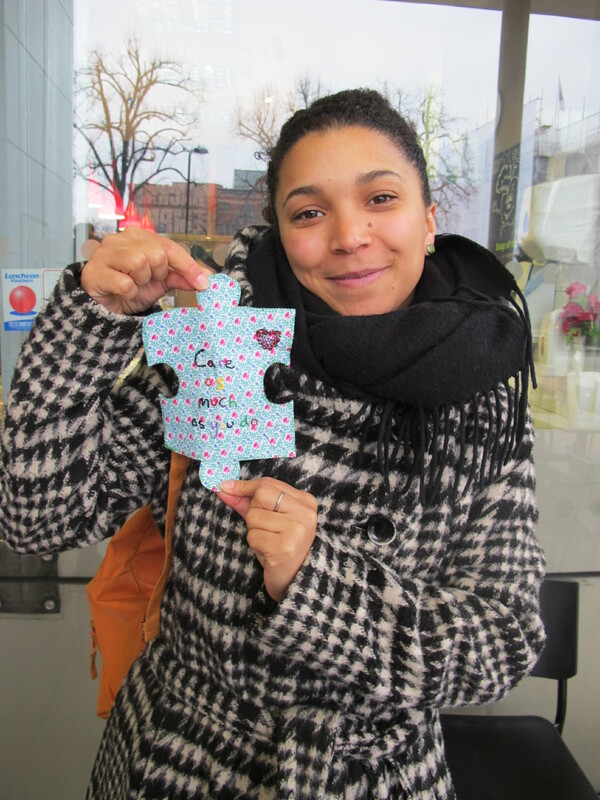 But it was a great meeting, Meg loved the jigsaw pieces and it turns out she’s an avid crafter her self. We chatted about our respective craft projects Meg told us how she’s been teaching her daughter how to knit. She was super down to earth and having craft in common made it easy to chat and relate to each other. We talked how living in Hackney connected us to people globally, as our friends, family and neighbours come form all corners of the Globe. We discussed why we loved living in multi-cultural community, the vibrant celebrations, the variety of food, the availability of beautiful fabrics and the constant connect to the rest of the world. Living in Hackney means we can not ignore global problems, a hungry child anywhere effects us all; our neighbours, our friends and our families. “Even in an area of deprivation like Hackney we know there are bigger challenges around the world, it’s important that we don’t just remember this but that we press our leaders to act against hunger globally” said Meg. The meeting gave us such a buzz! We felt a real sense of accomplishment. Meg seemed to enjoy the meeting too, I’m guessing talking about craft and community vibrancy is a good part of her job. Since then Meg has kept us informed about her correspondence with David Cameron. 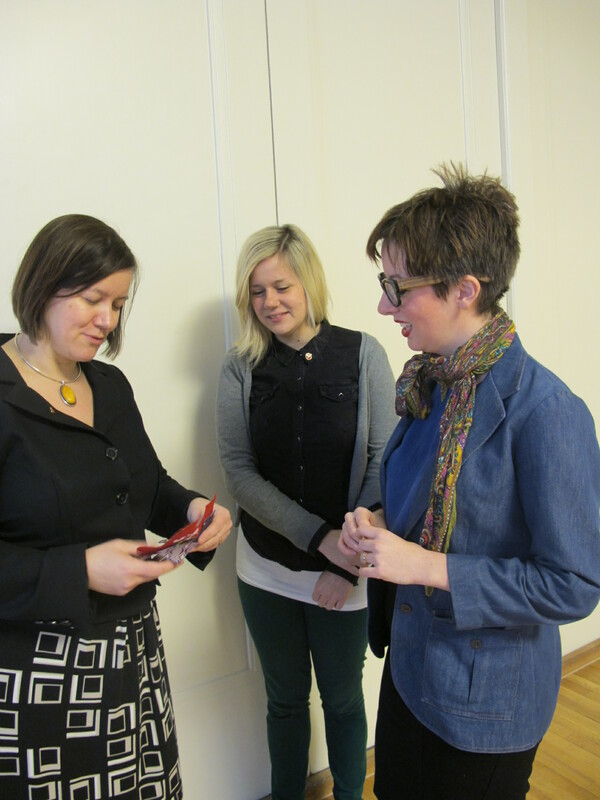 We all felt that engaging in political processes in a personal way is a really empowering. Turns out our craft nights are not just a good excuse for drinking wine they also tackle global injustice! nice one,… some of you folks may be interested in this: http://www.speak.org.uk . a few years ago we made the biggest dress in the world out of pieces of material which were seny from all over. it is now a marquee used at festivals and other places as a venue for helping folks learn about social and global justice / injustice :).